Although the autonomy of mobile computing devices has improved in the last decade, the gains are mostly through advancements in microprocessor and display technologies. Batteries themselves have remained largely unchanged in recent years, but a team of engineers at Northwestern University claims to have discovered a breakthrough that could revolutionize the industry. The researchers have developed an electrode for lithium-ion batteries that increases the capacity and recharge rate by 10 times. If accurate, the innovation could afford smartphones with an all-week battery life instead of a day, and recharge times would be measured in minutes instead of hours. 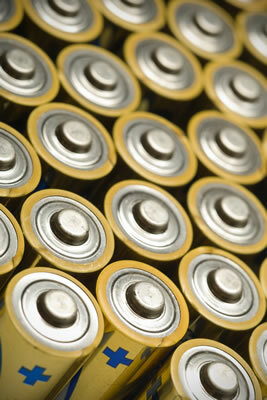 Even after a year of regular use, such a battery would be five times more efficient. Lithium-ion batteries are charged by a chemical reaction that causes lithium ions to move between the anode and cathode. As energy is used, lithium ions travel from the anode to the cathode through the electrolyte. This is reversed when recharging. The anode is composed of carbon-based graphene sheets and they can only handle one lithium atom per six carbon atoms. Scientists have attempted to replace carbon with silicon because it is far more efficient at transferring lithium atoms, but its charging capacity degrades too quickly. Meanwhile, because the graphene sheets inside today's batteries are only one carbon atom thick and comparatively long, the recharging process is hindered. Physorg describes the process as an "ionic traffic jam." The researchers have drastically improved both qualities by sandwiching clusters of silicon between the graphene sheets. This stabilizes the silicon while allowing the graphene to transfer a larger number of lithium atoms. To improve the recharge rate, the team uses chemical oxidation to create tiny 10-20nm holes in the graphene sheets, giving the lithium ions many shorter paths to travel instead of clumping along the edges. It's said that the group has focused on improving the anode but it should make further refinements when it begins working on the cathode. The technology is expected to reach consumers within three to five years. A full overview written by researcher Harold H. Kung has been published by Advanced Energy Materials (Volume 1, Issue 6, pages 1079-1084). That release is available through Wiley online library, though it's not free.